This technique is so easy and fun to create backgrounds. This was the recent class at my Sunday Technique class in my home. 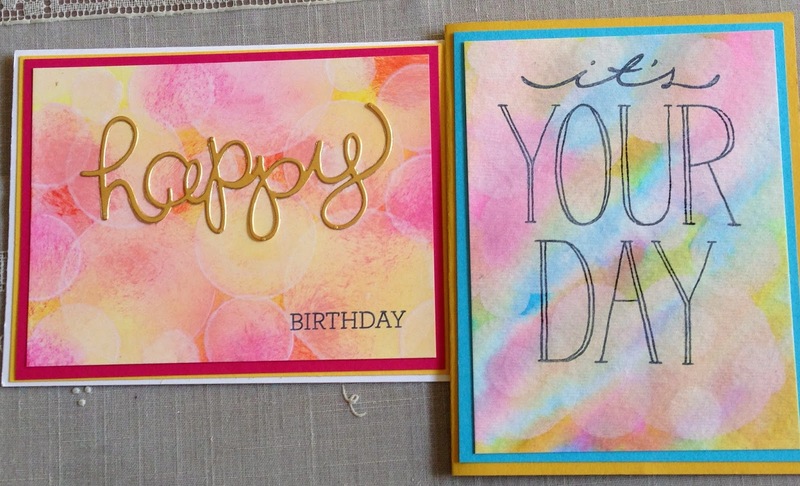 The Happy Birthday card uses Stampin'Up whisper white card stock while the It's Your Day card is using our watercolor paper. The watercolor paper shows more texture but both are very pretty in person. The circles were done by making a template using a window sheet and cutting out various sizes of circles along with a dauber circle. Using a dauber to apply white craft ink after the backgrounds are completely dry. The Melon Mambo, Daffodil Delight and Calypso Coral card had the colors applied with a sponge in a circular motion on the whisper white card stock. The It's Your Day card used an Aquapainter to apply Rich Razzleberry, Tempting Turquoise and Crushed Curry in a brush motion allowing the color to run on the wet watercolor paper. Once dry the card fronts were stamped using Stazon Black ink. The It's Your Day is from the four stamp set called Big on You. The Happy comes from a four piece die set called Hello You Thinlits and the birthday is from Crazy about You both are available as a bundle saving you 15%. They are all available in the Spring Occasion Catalog. Purchasing by March 31, 2015 allows you to get Sale-a-bration items with each 50.00 purchase.